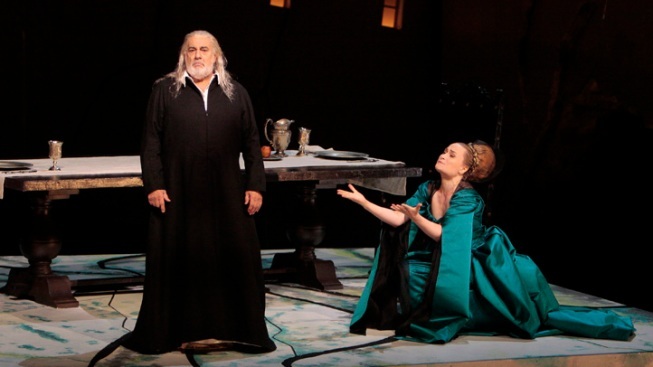 Placido Domingo as Francesco Foscari and Marina Poplavskaya as Lucrezia Contarini in a scene from Verdi's "The Two Foscari," at the Dorothy Chandler Pavillion in Los Angeles. At an age when most singers are long retired, Placido Domingo keeps taking on new challenges. The 71-year-old celebrated next year's 200th anniversary of Verdi's birth by having his Los Angeles Opera present the first production by a major U.S. company in 40 years of "I Due Foscari," an 1844 work that hints of the brilliance of later compositions such as "Rigoletto," ''Il Trovatore" and "La Traviata." In a season-opening performance at Dorothy Chandler Pavilion on Saturday night, Domingo sang the baritone role of the weary father, Francesco Foscari, the doge of Venice, rather than the tenor part of his condemned son Jacopo. Three years after his first baritone excursion, in the title role of Verdi's "Simon Boccanegra," Domingo sounded far more at ease with the darker part of his voice. While lacking the power to cut through the orchestra at times, Domingo has learned to generate heavier, more burnished notes from his bottom, which has developed during his late career switch to the lower register. In the revised count assembled by Domingo's staff at the LA Opera, where he is general director, this was his 140th role in a professional career that began in 1959. Two more Verdi baritone characters are upcoming: Giorgio Germont in "Traviata" at the Met in March, and the title role in "Nabucco" at London's Royal Opera the following month. Combining with Francesco Meli as Jacopo and soprano Marina Poplavskaya as Jacopo's wife, Lucrezia, in a stellar cast, the singers and music director James Conlon made a case that "Foscari" is a work that deserves to be seen and heard more often. The familiar themes of Verdi are there, with the focus on the complicated relationships between fathers and sons. Verdi's sixth opera, "Foscari" debuted at Rome's Teatro Argentina in 1844, and is based on Lord Byron's play "The Two Foscari" about the power conflicts of families in 15th century Venice. The Venetian leader, Francesco, already has been devastated by the loss of three sons to plague. Jacopo, his last son, has been exiled following false accusations. Francesco is helpless to overturn his son's sentence. And all the while the Foscaris' downfall is being plotted by Loredano, a rival on the secretive, powerful Council of Ten. With straggly white hair dropping over his shoulders onto his back and shaking his head, Domingo was a portrait of paralysis, trapped between son and state. Poplavskaya, with bulging eyes ringed with dark mascara and eye shadow, implored him to save Jacopo, to no avail. With several exposed high C's, Lucrezia is a difficult role, needing a mixture of stamina, determination and tenderness as the daughter of another noble family, the Contarini, tries to protect her children from the emotional trauma of their father's unjust punishment. Meli's sweet, soaring voice, conveyed Jacopo's anguish. Kevin Knight's set did not try for a realistic recreation of the prison in the Doge's Palace and instead left Meli to sing at times in a metal cage that was raised and lowered. Ievgen Orlov (Loredano), Ben Bliss (Barbarigo), Tracy Cox (Pisana) and Hunter Phillips (Servant of the Doge) rounded out a cast that didn't have a weak link. Director Thaddeus Strassberger, like Meli making his LA Opera debut, kept the action breezy and flowing despite the somber setting. Mattie Ullrich's costumes, dominated by reds, blacks and whites, created a tone of opulence. With fire-eaters and gondoliers for the Carnival scene, he injected a bit of spectacle. He also diverted from Francesco Piave's libretto at the end by having Jacopo's son drowned, presumably to eliminate the possibility of later revenge. Conlon conducted a propulsive performance, building the drama in the duets and trios. There are five more performances through Oct. 9, and the production is slated to appear at Valencia's Palau de la Musica in Spain (January), the Theater an der Wien in Austria (January 2014) and London's Royal Opera (October 2014). With the Verdi anniversary approaching in October 2013, opera companies around the world are planning tributes. In a time of financial turmoil, some focus on reinventions of regietheatre directors in the standard repertory, which puts inordinate emphasis on the creative teams of the stagings. By presenting the company premiere of a Verdi rarity, the LA Opera put the spotlight on the composer and the genius of compositions that are delighting audiences nearly two centuries later.